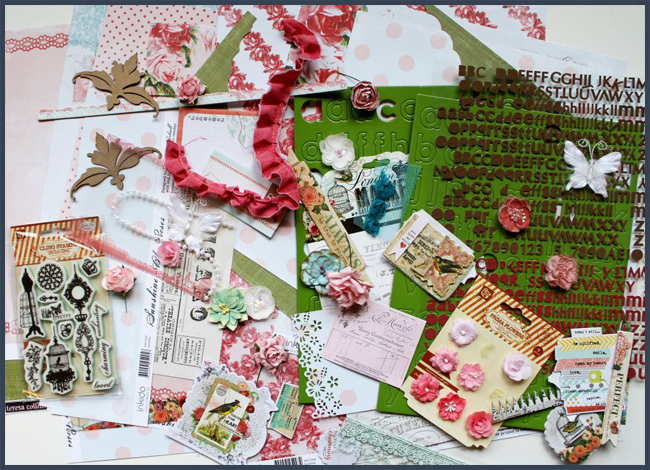 Erin Blegen: My Scrap Cabin: C'est Magnifique: Bits & Pieces GIVEAWAY!! There's nothing better than winning something, and we're going to give you a chance to do that. Leslie (the owner of C'est Magnifique) has gathered everything she has remaining from her July Kit, "Sweet Summer Days", and she's giving it away to one of our blog readers. The July Kit features paper from Inkido (a Swedish manufacturer) and a couple of sheets from Teresa Collins (USA) for contrast. Here's a look at what we're giving away which includes items from the kit, the flower add-on, and the embellishment add-on. Please note that since this is Leslie's "Bits & Pieces", you will receive partial packages of embellishments and some of the paper will be less than full sheets. So what do you need to do to win? Visit the giveaway post--->HERE, make sure you're following the C'est Magnifique blog, and add your name/country using the Inlinkz tool at the bottom of the post- that's it! Open Internationally!! You have until midnight July 12th. The winner, as chosen by random draw, will be announced July 13th! Good luck!